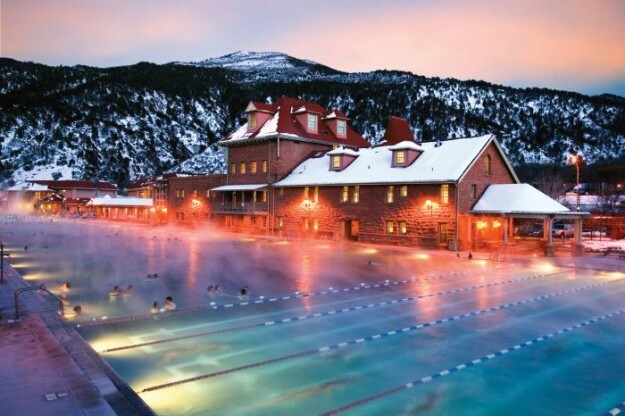 Glenwood Springs, just an hour west of Vail, has a lot to offer as a quick getaway no matter the season. We spent a couple of days and nights there over our recent mid-winter school break, staying at allegedly the most haunted hotel in Colorado (apologies to the Stanley in Estes Park) – Glenwood’s Hotel Colorado. They can’t put up a sign claiming George Washington slept there but they can boast that two presidents – one of them fairly notable historically – did sleep there. Teddy Roosevelt, the father of our national park system, and William Taft, who I’m sure did something of note, both stayed at the Hotel Colorado back in the day. You sense history in every nook and cranny of the rambling Italian villa-style hotel, but we did not encounter any of the spirits said to wander the cavernous hallways – presidential or otherwise. Infamous Chicago gangster Al Capone supposedly used to hang out at the Hotel Colorado, and during World War II the hotel was used as a naval hospital, with a morgue and crematorium set up in the basement. If that doesn’t generate some ghostly ectoplasm, I’m not sure what will. Only one member of my family, who shall remain nameless (and no, it wasn’t my ghost and zombie-obsessed 9-year-old), reported hearing ghostly footsteps during the night. Not saying how many cocktails may have been consumed the evening before. Regardless of how haunted it is, the Hotel Colorado is affordable and a killer location for taking advantage of the very nearby Glenwood Hot Springs pool and a handful of excellent restaurants. The Pullman, so named because of its proximity to the railroad station, is one of our favorites, although we didn’t hit it on this trip because it was slammed on a Wednesday night – even with Glenwood Canyon a three-hour night-time drive due to a rock slide. By the time we headed home on Friday, Interstate 70 was back open with two lanes of traffic during the day as well. Instead, we hit Juicy Lucy’s, a fun steakhouse in an historic building that’s even better in the summer with rooftop dining. Even more fun is a taco and hot-dog place just down the street that’s called Slope and Hatch and serves some of the most creative tacos I’ve ever tasted, including calamari, barbecue beef and curry lamb. Be sure to indulge in their excellent margs as well. And since we were in town for the purposes of attending the Colorado High School Ski Championships at Aspen High School – in which my oldest son Nick was competing as a Nordic racer – we also had to sample some up-valley restaurants. We tried La Creperie du Village in Aspen – a great little downstairs lunch spot perfect for a glass of wine, a delicious bowl of French onion soup and a plate of meats and cheeses. We also visited a longtime favorite in Carbondale for dinner – Phat Thai – a place that serves some of the most creative and tasty pad tai I’ve tasted on the Western Slope. To work off some of those calories we skinny skied along the Roaring Fork River on the Rio Grande trail, where a perfectly set classic track winds along the river in the tall pines. It was a great spot to get away from the seasonal hustle and bustle of Aspen but still close enough to Aspen High School to catch all the racing action. The Battle Mountain boys defended their state ski title in dramatic fashion with a come-from-behind, second-day victory over host Aspen. The Huskies’ repeat Skimeister (best all-around skier in the state) Quintin Cook scored piles of points for Battle Mountain by winning both the giant slalom and slalom titles at Aspen Highlands and then turning in top results in the Nordic as well. The guy literally can do it all on skis. Nick is new to Nordic but qualified for states and finished both classic and skate events, giving us a great excuse for a mid-winter escape (albeit in spring-like conditions) to the Roaring Fork Valley. It’s inspirational to see all these kids laying it on the line in heated battle with ski-town rivals from Summit County, Aspen, Steamboat, Grand County and the rest of the state. And it reminds us all over again how great it is to live in Colorado’s high country. 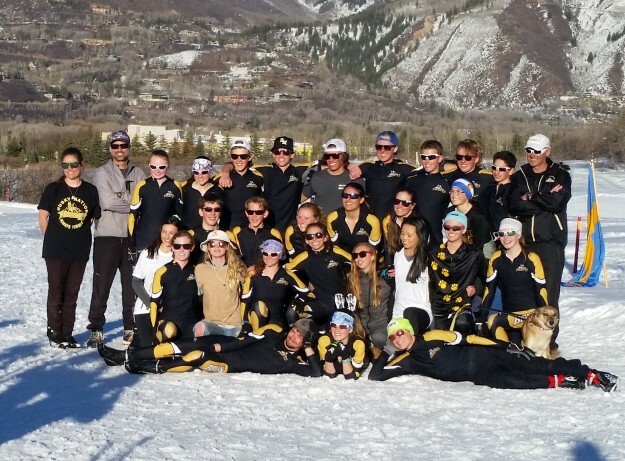 The state champion boys and runner-up girls Battle Mountain Huskies Nordic team at Aspen High School on Friday (David O. Williams photo).